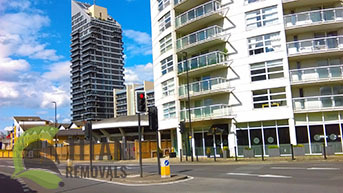 Titan Removals is a full service moving company that operates in all E and EC postal areas in the London Borough of Tower Hamlets. Have your house removal in Tower Hamlets carried out by our company you will be spared of all negative consequences that are usually associated with such a line of work. When we say that are a full service moving firm, we mean it. Our home movers will not simply haul your boxes on a van and drive off. Make sure to check out the wealth of complementary services that we can provide you with in connection to your household relocation project, such as end of tenancy cleaning, storage and even basic rubbish removals. Our vans and Lutons are supplied with all the necessary safety gear to ensure that the transportation of your sensitive and expensive office equipment goes smoothly and without incidents. The licensed commercial movers in Tower Hamlets we will assign to carrying out your project are going to pay extra attention to those items that you tell them to. Furthermore, we maintain a rather flexible schedule on which office removals in Tower Hamlets are taken care of in our company. You can make a reservation for any time you need, including on weekends or at night. What we are going to make sure is that your commercial relocation is completed on time. The old premises will be vacated before your contract for the place expires and you will move in the new office quickly, so that you can go on with your business with minimal disturbance. Titan Removals has one of the best moving teams in London. Our licensed experts are knowledgeable about the moving industry and they possess skills and experience that rarely find a match. They will help you with any small removal in Tower Hamlets that you need comprehensive assistance with. We will definitely find a vehicle that is suitable for your project’s needs. Our fleet consists of well maintained vans and trucks that are all safe, secured and navigated through the latest GPS systems available. Your small specialized removals in Tower Hamlets, including a variety of delivery jobs, are in safe hands when they are taken care of by our experts. Check out the rest of our moving services too, you will notice there is nothing we cannot help you with when it comes to moving in E and EC areas. At Titan Removals we are dedicated to your comfort. 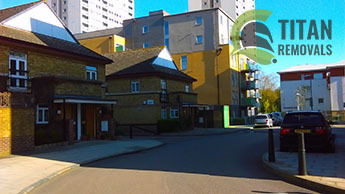 Any removal job in Tower Hamlets will be inexpensive and done properly when entrusted to us. Call for booking, quote and further information! Tower Hamlets is one of the most diverse and fast developing areas in Greater London these days. Most of its territory is to the north of The Thames, with only a small portion to the south. The current population here according to the most recent estimates reaches 284 015 people. Those include many minorities like British Somalis, and people of f Chinese, Vietnamese, Indian, Pakistani, and Black African/Caribbean origin as well. Tower Hamlets is particularly well known for its well established and thriving Bangladeshi community which make up for as much as 32% of all people living here. Recent redevelopment and investment projects, especially around the territory of the former West India Docks and Canary Wharf have made Tower Hamlets a major player on the global economic scene. While the City is traditionally a leader in the stock market exchange and other business ventures, more and more traders and international companies choose to settle down in the newly developed areas to the East. Currently there is over a million square meters of commercial floor space in Canary Wharf that is actively used. In addition the borough is a leader in the field of higher education in London. The main campus of Queen Mary University of London – considered to be one of the top universities in Europe – is here. Queen Elizabeth’s Olympic Park, which was built specifically for the 2012 Summer Olympics in London cover parts of Stratford, Bow, Leyton, and Hackney Wick. Currently University College London is planning to build a new campus in the park, while other parts of it are used by a variety of companies and community groups for an array of purposes.